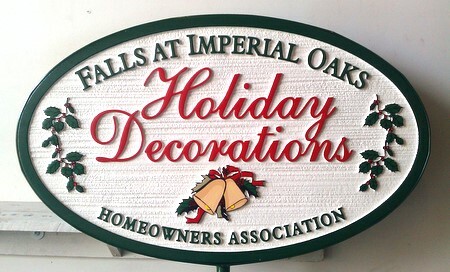 Above is shown a carved and sandblasted High-Density-Urethane (HDU) sign made with the label "Holiday Decorations" for the "falls at Imperial Oaks" Home Owners' Association. This sign has been lightly sandblasted to give the sign background a wood-grain appearance. A similar Yard-of- the-Month type sign could be used as the award to the homeowner with the best holiday decorations. The sign, as shown here, has raised art (jingle bells, holly sprigs), text and border which are carved in 2.5-D (raised, flat relief). After hand-painting with bright, long-lasting automotive-type enamels, this plaque is clear-coated, dried and clear-coated again for waterproofing and UV protection.